Superdump® Dump System - What is a Super Dump? A Super Dump is a dump truck equipped with a Strong Arm trailing axle, which allows the truck to transform on demand, significantly stretching its overall axle length so that it can carry substantially more weight in compliance with bridge laws (legal vehicle weight limits). Video: What is a Super Dump? 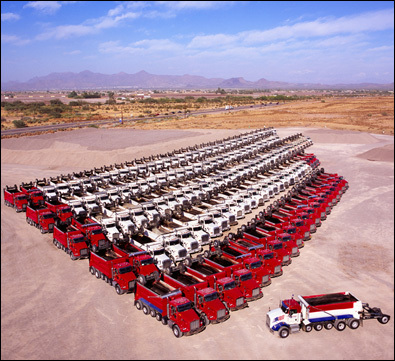 A Super Dump has four to seven total axles, and is capable of legal payloads ranging from 19-26 Tons. Super Dumps carry payloads equal to trailers and transfers, while maintaining the maneuverability and quick turnaround time of a standard tandem dump truck. The unique combination of huge payload & quickness is what makes the Super Dump the most productive and profitable dump truck on the road. According to the federal bridge formula (and most state weight laws as well), a vehicle's allowable weight is increased by adding more axles and/or adding more overall axle length (the distance from the first to the last axle on the truck). Well the Strong Arm® trailing axle does both: When the Strong Arm® is deployed, it adds an axle plus 11-13 feet to the overall axle length, and thereby increases its allowable weight by as much as 14,000 lbs (7 tons). Super Dumps can haul more paylaod than any other straight dump truck. And of course, when you can carry more payload each trip, your revenue and profits increase significantly. When you invest in a Super Dump instead of a typical straight dump truck (including tandems, tri-axles, quads, and quints), the additional payload hauled each trip results in the Super Dump paying for itself - in additional revenue alone - many times over. Productivity and profitability aren't functions of payload alone, however. After all, transfers, pup trailers, and long end dump trailers carry large payloads like Super Dumps. But those dump trucks are tedious, cumbersome, and time-consuming; such that the additional payload they haul compared to typical straight dump trucks is almost completely squandered by their inefficiency and slowness. This is where the Super Dump truly stands apart from all others: it hauls the payloads of dump trailers and transfers, while being just as agile and quick as simple straight trucks. When at the dump site, and whenever the dump body is empty, the Strong Arm® stows above the dump body, completely out of the way for dumping operations, and without hindering the truck's maneuverability. While a trailer or transfer can haul 26 Tons of payload to the job site, when it arrives at the site it's STILL a trailer or transfer, and the task of backing up and dumping (twice, for a transfer or pup) can be painfully time-consuming. Meanwhile, a Super Dump (carrying the same 26-Ton payload) arrives at the job site, stows all of its auxiliary axles including the Strong Arm®, and gets in, gets dumped, and heads back to the loading site as quickly as any short straight dump truck. For short- and mid-range jobs, which are typical for dump trucks, a Super Dump will usually LAP trailers, pups, or transfers, delivering an additional load each day. At 26 Tons per load, that means a lot in terms of revenue and profitability. And the shorter the distance, the more the Super Dump's efficiency shows, as it can lap the trailers and transfers several times in one day. The Super Dump is more profitable than any other straight dump truck because it hauls significantly more payload each trip, and it's more profitable than dump trailers, pup trailers, and transfers because its superior maneuverability and quickness results in additional loads delivered to the job site. Strong Industries originally manufactured trailing axles only, retro-fitting the attachment hardware for installation on dump bodies of every size and shape, from just about every dump body manufracturer. This process gave us a unique opportunity to analyze all the different body designs, from the perspective of what works well for general dump truck performance, as well as what works well for Super Dump performance. After all, a Super Dump is all about maximizing payload, and the vast majority of dump bodies waste payload with materials and designs that are far heavier than they need to be. So we ultimately decided to manufacture our own dump bodies as well, taking the best of the designs and features we'd encountered, and creating all-new designs that are the perfect balance of durability and body weight. From the shape of the bed to the shape of the tailgate, the exact type of high-strength steel to use in each and every component, and the precise placement of the body on the truck chassis for the optimum weight distribution: Maximum payload with maximum performance has always been our mantra, and the Strong Industries dump bed reflects this in every way. It's now been over 20 years since we started building the dump bodies, and with each new model we've designed, we've improved the durability while maintaining maximum payload. Our newest Super Dump body will last longer than any we've ever built, while our customers continue to benefit from the combination of huge payload and quick turnaroud that makes the Super Dump the most profitable dump truck on the road. The new Super Dump features a new & improved dump body, two options of the latest Strong Arm trailing axles, and state-of-the-art mobile technology with the IntelliTruck system. Check out the video to learn about all the latest improvements. The Super Dump can carry twice as much payload as the typical tandem dump truck in accordance with bridge laws and weight regulations (federally as well as most state laws). But what does this mean for the owner of the truck? If you currently own a plain old tandem truck (or you're looking to buy a dump truck), how would investing a little more into the initial cost of a Super Dump affect your immediate and long-term income? Check out this video, where we break down the numbers for you. Maybe it's obvious that a Super Dump is more productive and profitable than a plain tandem dump truck, or even a tri-axle or other straight truck. But what about a long dump trailer? Some folks mistakenly assume that because dump trailers carry as much payload as Super Dumps, they're just as productive. However, as this video illustrates, productivity is a function of payload AND quickness, and the Super Dump will often lap a dump trailer (multiple times) each day.